Longing for a quiet and restful country experience? Harrietville has everything you are looking for. Majestic trees, beautiful mountain streams for swimming or fishing, a trout farm nearby for a guaranteed catch! Bike riding, bush and river walks. Spring and Autumn are alive with colour. 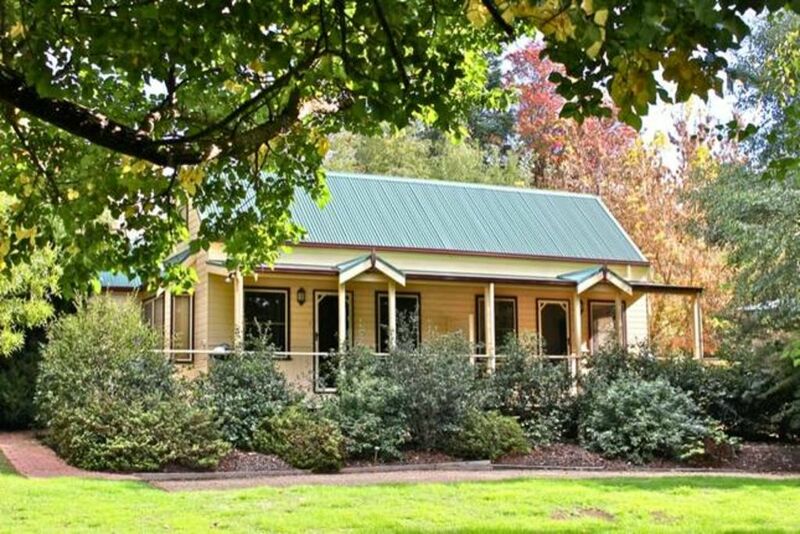 Within 2 minutes WALK from : the centre of Harrietville! Catch a bite at the Trout & Salmon farm to create the most delicious, fresh & easy BBQ fish dinner! Harrietville's fantastic establishments also offer regular live music, wood fired pizza nights, blues & jazz nights, open jam sessions, outdoor acoustic sessions, pool comps and on a Friday night the essential country pub meat raffles! In Summer, cool off at 'Tronoh Lake', a fantastic 70 ft deep lake with jetty, shadesails, BBQ area & pontoon. A great spot for fishing in the fishing season too! Enjoy a BBQ by the River at the local playground with new equipment, a rotunda with BBQ and plenty of room to kick a footy! Harrietville is surrounded by some of the best tracks for dirt biking, 4WDing & mountain biking or take the road bike over Hotham for some spectacular views - use Harrietville as your central base! With all that Harrietville offers, you still have the rest of the Alpine Valleys at your doorstep! The regions renowned Wineries, Rail trails & local producers are also at your doorstep - let us arrange a tour for you! Art galleries & History, Wineries & Breweries, Horse riding, paragliding, Mountain biking, Festivals & events, Fishing, Hiking, Nature & Photography, Snow fun, Relaxation and the ideal location for you destination wedding!! We used Autumn Leaf cottages as a base for a 3 day ski trip to Mt Hotham, we found the cottage warm, comfortable and relaxing after a long day. close to the pub which is handy for meals and the cottage has a great little kitchenette for breakfasts. Would stay there again. Thanks Darren, hopefully see you back for a Spring ski! I had a great stay. Easy to book and organise check. Cosy little place at a reasonable price and a fantastic location close to town centre. Dont expect a modern fitout as this has a rustic appeal. Thanks Grahame! Hope to see you again some time. Loved the Cottage, photos dont do it justice. Thanks Jordan, Hope to see you again! It was a great place just right for a family of 4. Loved the comfortable clean and tidy cottage with all of the basic needs supplied. The host is very kind and hospitable. A bigger TV and a bath would have improved the experience. Thanks Lasitha! Hopefully you will visit us again soon. We thoroughly enjoyed our stay at Autumn Leaf Cottages. It was so quiet and peaceful and exactly what we needed. It felt secluded however was close to the hub of the village. The cottage was very comfortable and the hosts were friendly and accommodating.